So here’s a germ of an idea. 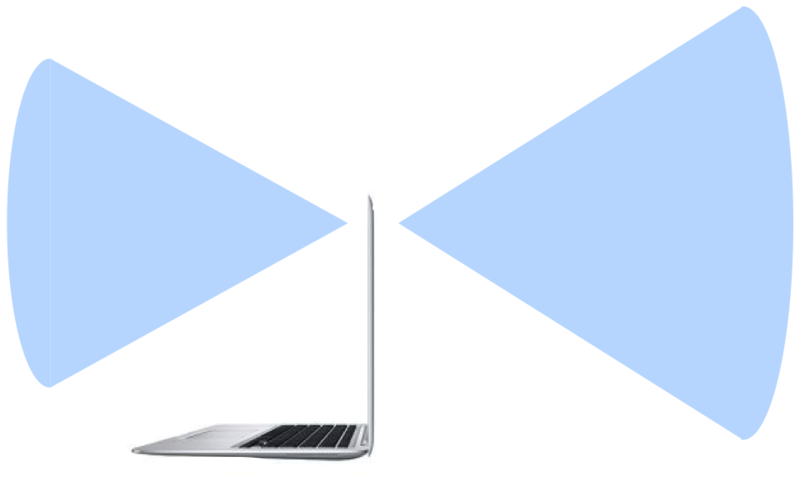 What if the Macbook Pros had a second camera, mounted right on the other side of the lid, across from the current camera? Let me set the scene for you. You’re at the office, trying to setup an impromptu Skype conversation with your remote office (like ours, which you should join, by the way – it’s awesome). Let’s also assume you don’t have deep pockets, so you can’t afford to buy fancy high-end Cisco Telepresence products. If there’s more than two people in the conversation, you have a Hobson’s choice facing you – either seat everyone squeezed together, so people on either side of the call are visible to all the people on the other side; or have each person open up their own Skype clients on their own laptops, to join that same conference. Silly. Now, imagine turning on the (wide-angle) camera on the other side of the screen, at the same time as the front-facing camera. Now, one camera lets you participate yourself, and the second lets you can include everyone else around the table into the conversation. Pretty convenient! There’s a slight (!) wrinkle with this idea – while you can include the entire table into this video conversation, only you can see the video feed from the other side of the chat (sitting as you are on the side of the screen!). That’s not very nice to the other people in the room! 3-D virtual reality video conferencing? Whoa. OK, so how about this second, more crazy idea. Imagine 5 people with their Macbook Pros sitting around the table, chatting with someone on the other side of the continent. Now, imagine all those wide-angle back-facing cameras scanning the room, collaborating with each other (mediated via iChat over Bonjour, natch), composing a 3-D image of the room. The guys on the other side don’t just see the 5 headshots now – they actually see a fully-rendered view of this room, able to move the scene around to collaborate with the people more realistically. This sort of virtual reality chat only sounds science fiction until someone actually builds it. What do you think? The second idea seems pretty useful. I feel Google Street View is already doing a fair job in stitching together images to create a seamless view of the environment (compare this to Bing’s street view). Why just apple … not everyone is an apple fan? This could be a revolutionary idea for chromebook though … the next thing on my Amazon wishlist!